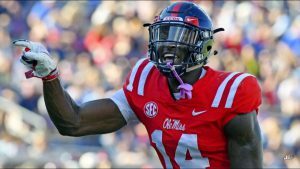 The most polarizing player of the 2019 NFL Draft DK Metcalf will generate lots of discussion. 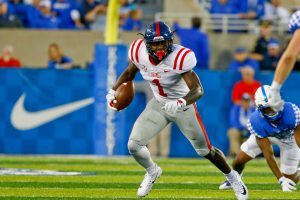 As a highly sought after recruit and my #2 ranked WR coming out of High School in The Devy Report, he was a surprise commitment to Mississippi. He started off his freshman season promising with a touchdown in each of the his first two games in college. Unfortunately, he broke his foot and he ended his season by redshirting. He bounced back to have a solid, but not great season. In 2018, Metcalf was having his best season of his career until he suffered a season ending neck injury in the seventh game. Then the NFL Scouting Combine happened and Metcalf’s stock has taken off. He ran a 4.33 and 4.38 40 yard dashes at the combine! Those are beyond ridiculous numbers for a 6’3” 228 lb man! Equally impressive were his 1.5% body fat, 40.5 vertical jump, 11 feet 2 inches, and 27 reps on the bench press! On the flip side, Metcalf had some severely concerning numbers in the 3 cone drill of 7.38 and a 4.50 short shuttle drill. Tom Brady had a 7.20 3 cone and 4.38 short shuttle and we can all agree he’s anything but athletic. We’ve discussed his injuries and lack of production, then his combine performance. It’s a rollercoaster ride and so have the conversations about his potential. Now let’s talk about his film. Metcalf lined up on the outside left most of the time at Mississippi with occasional snaps on the outside right. Despite the rough short shuttle and 3 cone numbers, which indicate short area quickness issues, Metcalf has good releases off the line of scrimmage. He shows good feet, uses his well hands, and does a great job of accelerating into his route. Metcalf will mix up inside and outside releases. 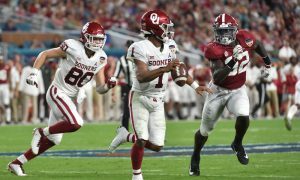 Some of his biggest plays in college have come from great inside releases off the line of scrimmage and cornerbacks couldn’t recover once he turned on his speed. After his releases, he shows inconsistency in his route running. Sometimes he threatens a defenders leverage and he gains good separation. Other times he takes an easy path and the defender breaks up the pass. For a player with great physical stature and 27 bench press reps at the combine, he doesn’t live up to his potential with physicality. He can lose position on his route down the field and even at the catch point from a defender. Metcalf’s route tree is fairly limited. He ran mostly hitches, comebacks, fades, and go routes. Sprinkle in a few slants, posts, and outs as well. I wanted to see more dig routes, crossing patterns and sail routes. After the reception, Metcalf is exponentially better if he catches the football on the run and can be difficult to catch from behind due to his speed. But he hesitates when catching a pass with his feet stopped and isn’t aggressive. This allows more pursuit defenders to get in on the tackle and limit his gain. Metcalf will break tackles from defenders if he has that initial momentum. Metcalf prefers to use his long frame to reach over a defender to catch the football. Rather than boxing them out to high point in front. He will also body catch more of these jump balls than is ideal. He doesn’t show much of an interest in blocking, nor does he finish blocks. Metcalf will push off to gain separation just before the football arrives, but he has been called for that because he hasn’t learned the art of making it subtle. The most physical part of his game is his long stiff arm after the reception, which can keep defenders at bay. Metcalf has a huge catch radius and tracks the football well. He can come up with some big time catches, especially in the endzone. However, he drops more passes than I expected. Sometimes they’re concentration drops and trying to run before securing the pass. But other times the ball will slide right through his hands. Metcalf also doesn’t come up with as many 50/50 targets or low passes as I anticipated. Overall, Metcalf has rare speed and burst for a big WR. He only played 1.5 seasons in college and needs lots of development to his game. 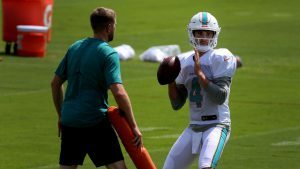 His lack of experience and poor quarterbacks in college give hope that he can fulfill more of that potential to be a better NFL WR than in college. But after watching his film, I have more pause about Metcalf’s game than anticipated. He’s far from a finished product. Metcalf has the biggest boom or bust potential in this class. His ceiling is a WR1 for an NFL team and a FF WR1. His floor is a WR2 for an NFL team and he’ll be an inconsistent FF starter. Metcalf needs to work on his physicality, route running, consistency catching the football and his effort. No matter what, we hope Metcalf stays healthy. But he could win your team championships or leave you disappointed for years.